The Iams and Eukanuba brands are owned by the huge Proctor and Gamble organisation in the US, and before we even get to look at Iams pet foods, we have to acknowledge that there is a love/hate relationship with Iams and the pet owning fraternity, and it boils down to one thing - animal experimentation. Along with Hills/Pedigree/Eukanuba, Iams have in the past used animal testing in the formulation of their recipes. 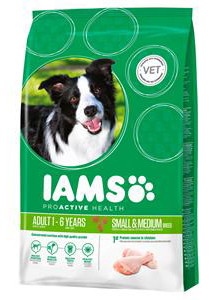 However, the purpose of this site is to look at products, not to moralise, so lets look at Iams and what they offer. Although Iams sell a lot of dog and cat food, when comparing like for like with the other foods available, it has to be said that Iams do use wheat in some of their recipes which is not one of the best digested cereals, and has been linked to food intolerance in some sensitive animals. Also they do not name the animal fat that they use, which presumably means it could be from any source. It would be nice to see lamb fat with lamb meat - at least you know what you are feeding! For this reason we would not recommend it as highly as some other brands, but if it suits your dog then who can argue with that! 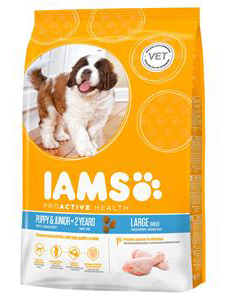 Iams generally produce a good quality food at a fair price, but the inclusion of wheat and un-named animal fats means that it may not suit some dogs with an intolerance to certain ingredients. Hydrolysed Animal Proteins are there mainly as flavour enhancers (like a stock cube!) but again are not from a named animal source. Expect to pay £31- £37 for a 12kg sack. Although not as expensive as some, there are natural foods available, not containing wheat, that are cheaper. Dried Chicken And Turkey (28%), Maize, Wheat, Animal Fat, Dried Beet Pulp (3.1%), Sorghum, Barley, Hydrolysed Animal Proteins, Dried Whole Egg, Brewer'S Dried Yeast, Potassium Chloride, Sodium Chloride, Calcium Carbonate, Sodium Hexametaphosphate, Fructooligosaccharides (0.15%), Linseed. Maize, Dried Chicken And Turkey (26%), Wheat, Animal Fat, Rice, Dried Beet Pulp (2.8%), Hydrolysed Animal Proteins, Fish Oil, Dried Whole Egg, BrewerS Dried Yeast, Potassium Chloride, Sodium Chloride, Fructooligosaccharides (0.15%), Glucosamine.